In a series of tweets, Pawan Kalyan touched upon many things but all those tweets addressed individuals in context with utmost courtesy and was only in questioning tone. Sri Reddy, Ram Gopal Varma, Pawan Kalyan, Sandhya Naidu, Maadhavi Latha, Jeevitha Rajasekhar, Apoorva and few more are the names that we commonly get to see in news channels and newspapers these days. What is the common thread running through all these people. The allegations of casting couch! While Sri Reddy has made allegations on many top directors and producers of exploiting her, Pawan Kalyan was merely dragged into the controversy only for putting across a piece of advice of approaching the situation through legal forces. But the man who, admittedly, played the strategical game in this situation is Ram Gopal Varma. Sri Reddy had used a cuss word for Pawan Kalyan which irked the film industry, fans of the actor and genera audiences. And exactly a day later, Ram Gopal Varma admitted that he instigated Sri Reddy to abuse Pawan Kalyan to grown into a bigger force. He has a logic behind it only which he understands! Many people reacted strongly, favourably and in many adverbial way, but Pawan Kalyan chose to remain silent. But now he has broken the silence on the issue and spoken about how all these situations are linked to his political journey. In a series of tweets, Pawan Kalyan touched upon many things but all those tweets addressed individuals in context with utmost courtesy and was only in questioning tone. 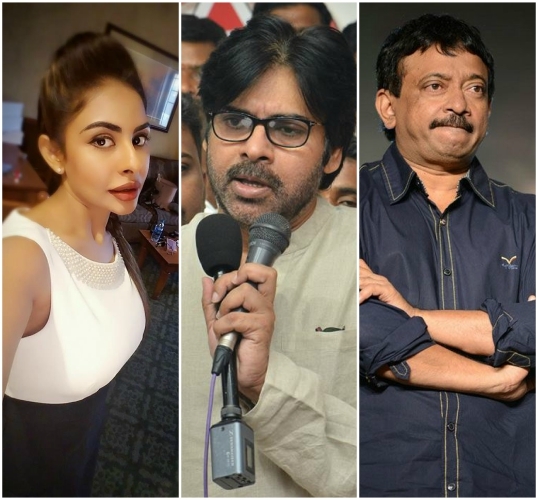 Pawan Kalyan quoted all his tweets – “If I cannot defend the honour of my mother I better die” – referring to the abuse Sri Reddy had against him. Pawan Kalyan said that the media, naming few news channels, is helping a Chief Minister in achieving a goal and he is the target for all this. Pawan Kalyan also asked the Chief Minister of Andhra Pradesh, N.Chandra Babu Naidu, why is he letting the media to run the show in his political empire and why his family is being dragged into this controversy. Sri Reddy photo looks different in every post. She looks nothing like this in reality. Photoshop much! Wow ! TDP trolls are roaming in pinkvilla !! Advising someone on how to react when one’s mother is targeted by cut throat, corrupt, politicians . cbn is digging his own grave. Mudslinging on pk to deviate people from cag report issue and his corruption. We all ready to die from the time we are born. Death is in God’s hands. Politics is a gymmic and everyone is playing their part. Now you have more stmpathy though your mom. Bit you will not win. Like your brother. Fate.